If you're on a diet, you'll love this delicious Parsi dish. Fresh coconut, green chilies, coriander, and mint make it exceptionally flavorful. 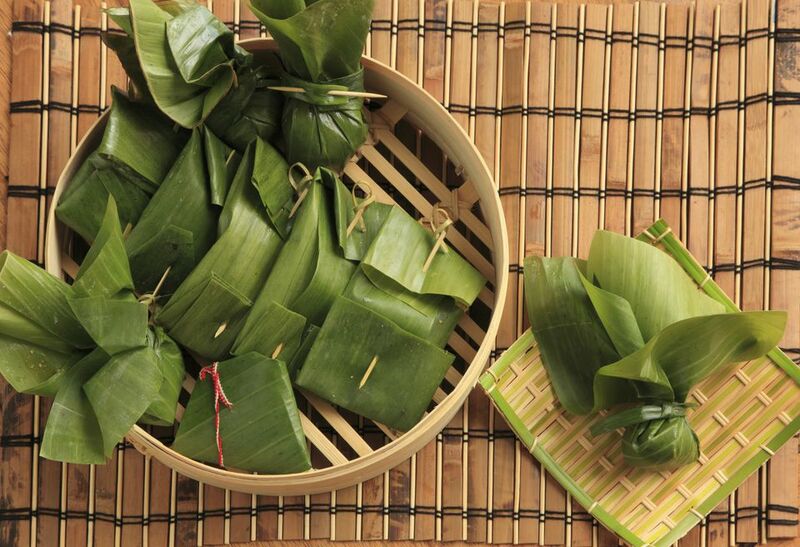 It also looks gorgeous when served wrapped up in a banana leaf. Everyone at your table will love the fun of opening their tasty little package. Place fish steaks on a large rimmed baking tray. Drizzle lemon/lime juice over them and sprinkle salt to taste. Turn pieces to coat with marinade thoroughly. Set aside for 20 minutes. In a blender, add coconut, chilies, coriander, and mint leaves, ginger and garlic, cumin and turmeric powders, and salt. Blend to a smooth paste. Add as little water as possible, if necessary. Divide paste into 2 portions, and use each portion to coat the pieces of fish on each side thoroughly. Set aside. Pat dry the banana leaf pieces and smear lightly with oil on the smooth side. Place one piece of fish in the center of each piece of leaf and wrap into a neat parcel. Tie with twine or cotton string. Cook in a steamer for 15 to 20 minutes. Place each piece in the center of a plate and serve immediately.